I had a skein of novelty yarn call "Jester" left over from years ago. I can't even find this yarn any more. It made out of 97% rayon and 3% polyester. It makes great Spring and Summer cloth. 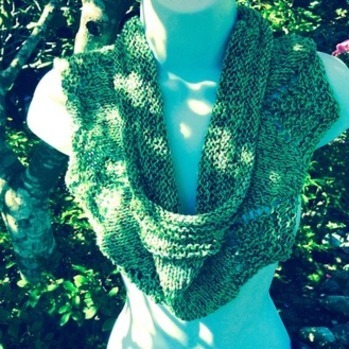 I wanted to create a one-skien knit accessory for neck and shoulder. After a few attempts, I came up with this pretty little shoulder shrug. The shrug can also be worn as an infinity scarf creating a different look. Then when I finished with this project, I decided to add a few more sizes to the pattern. So my one-skein project may turned out to be 2-skein project for some people. 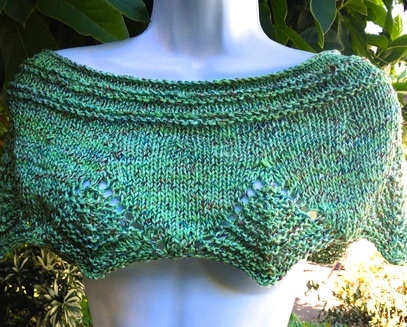 Description: A small shoulder shrug knitted in rounds starting from the lower edge. The diamond garter edge creates quite an attractive look to this shrug. The upper portion is alternated with sections of garter stitch and stockinette stitch. 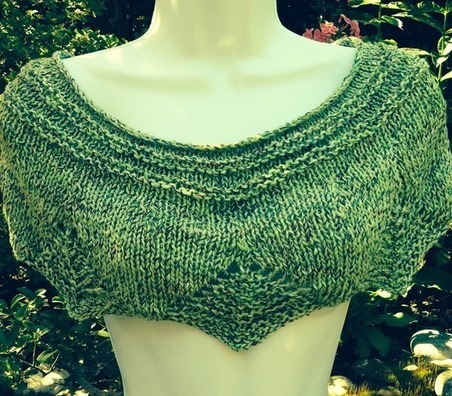 The rolled edge neckline create a nice smooth finish to the shrug. Measurement at rest: Available in small, medium and large. Top edge = 30” (32, 36) Bottom edge = 42” (47, 52). Gauge: 4 sts/inch over stockinette st using US #10 (6mm). I used a much bigger size needle than the yarn’s recommendation. Circular knitting needle US #10 (6mm). The length can be between 30-36 inches long. 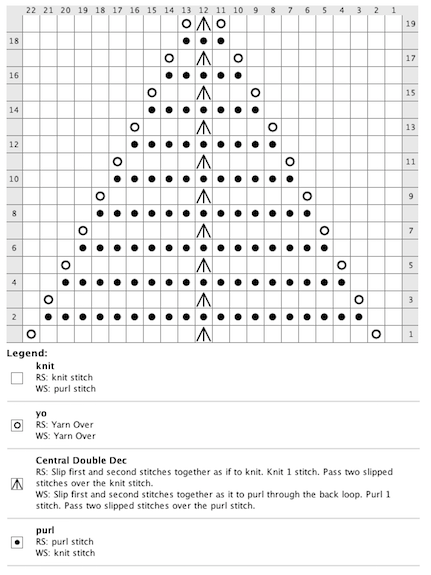 Diamond Edge Pattern (Multiple of 22 sts) See also attach chart for the pattern below. Rnd 1: *K1, yo, k9, dbl dec, k9, yo; rep from * to end of round. Rnd 2: *K2, p19, k1; rep from * to end of rnd. Rnd 3: *K2, yo, k8, dbl dec, k8, yo, k1; rep from * to end of round. Rnd 4: *K3, p17, k2; rep from * to end of rnd. Rnd 5: *K3, yo, k7, dbl dec, k7, yo, k2; rep from * to end of round. Rnd 6: *K4, p15, k3; rep from * to end of rnd. Rnd 7: *K4, yo, k6, dbl dec, k6, yo, k3; rep from * to end of round. Rnd 8: *K5, p13, k4; rep from * to end of rnd. Rnd 9: *K5, yo, k5, dbl dec, k5, yo, k4; rep from * to end of round. Rnd 10: *K6, p11, k5; rep from * to end of rnd. Rnd 11: *K6, yo, k4, dbl dec, k4, yo, k5; rep from * to end of round. Rnd 12: *K7, p9, k6; rep from * to end of rnd. Rnd 13: *K7, yo, k3, dbl dec, k3, yo, k6; rep from * to end of round. Rnd 14: *K8, p7, k7; rep from * to end of rnd. Rnd 15: *K8, yo, k2, dbl dec, k2, yo, k7; rep from * to end of round. Rnd 16: *K9, p5, k8; rep from * to end of rnd. Rnd 17: *K9, yo, k1, dbl dec, k1, yo, k8; rep from * to end of round. Rnd 18: *K10, p3, k9; rep from * to end of rnd. Rnd: 19: *K10, yo, dbl dec, yo, k9; rep from * to end of round. Rnd 23: *K 10, dbl dec, k 9; rep from * to end. Rnd 27: *k9, dbl dec, k8; rep from * to end. Rnd 31: *K8, dbl dec, k7; rep from * to end. Bind off all stitches. Cut yarn and weave all loose end behind work. Block piece if preferred. dbl dec = double decrease (in this case center double decrease). It is done by slip 2 sts together knitwise, knit the next st, then pass over the 2 slip sts. This would make 2 sts decrease with middle st on top of the center.